Nothing says “I Love You” like 80’s music references. | sara, darling. Nothing says “I Love You” like 80’s music references. 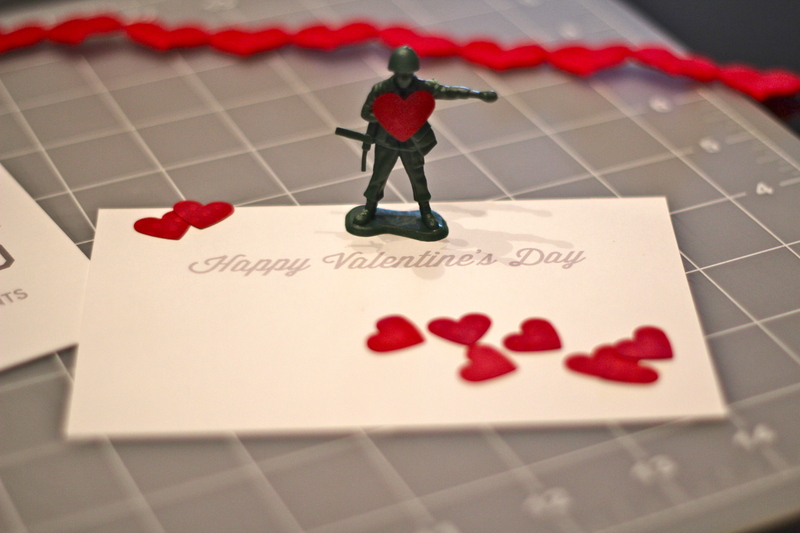 Any excuse to show people how much I love them is alright in my book, even a crimson-saturated singles-awareness hallmarky holiday in celebration of a guy who wrote the first valentine in prison to his jailer’s daughter before being beheaded. I’d like to see that sentiment on a candy heart. Speaking of candy hearts, I’m a little sad to see old “fax me” traded in for the trendier “text me” on these little chalky treats, even though neither of those are ways I’d consider to be charming ways to communicate your love. I’m a big fan of ye olde printed material for heartfelt sentiments, so I decided to design myself up a little valentine this year to send to some of my friends. Inspired by Ever So Lovely’s Valentines Exchange program as a deadline, I set to work, armed with my extensive knowledge of 80’s love songs, an array of colorful sharpie pens and some charming fonts courtesy of the great folks at Lost Type Co-op. With only an eensy bit of photoshop help from my uber-designy boyfriend with whom I share both marriage and a creative business, I cooked up something I thought was a little bit cheeky fun (my favorite) and a lot of heart, brown sugar and heavy cream. Wait, no, that last bit was from my recipe for frosting, but I think it applies anyway. And the best part– besides giving my friends a little smile– is that I designed it myself, which I promise is you is a BIG DEAL. Since I hold down the more writing-oriented things at Fixer Creative (our business), my involvement in design is more of a creative director who dreams up fun ideas and a design editor who gives feedback on design until things feel just right for our clients–but I don’t spend time immersed in Adobe programs myself, despite wanting to acquire enough skills for me to create some things myself. This year I decided to so just that, and you only learn by doing. Self-directed projects for the win! I’m super excited about these little guys who went out in the mail Saturday and are hopefully showing a few of my friends some love today. 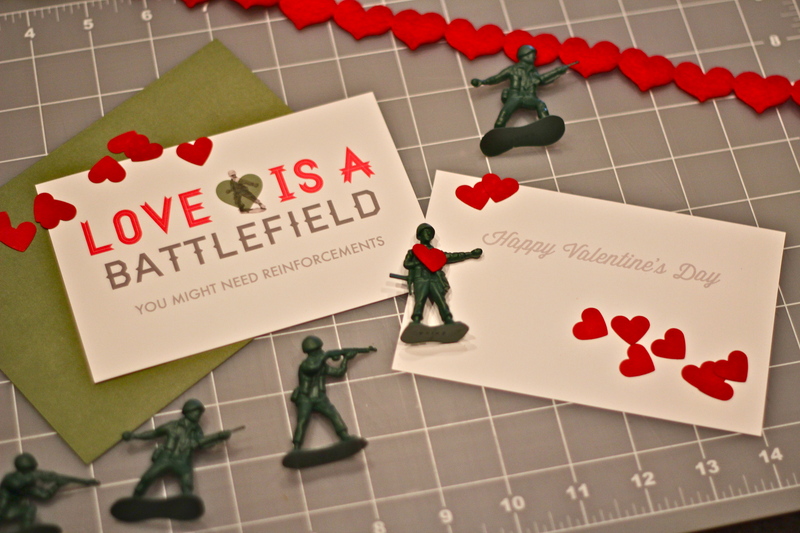 I sent them with one of the little army guys with a big red heart. 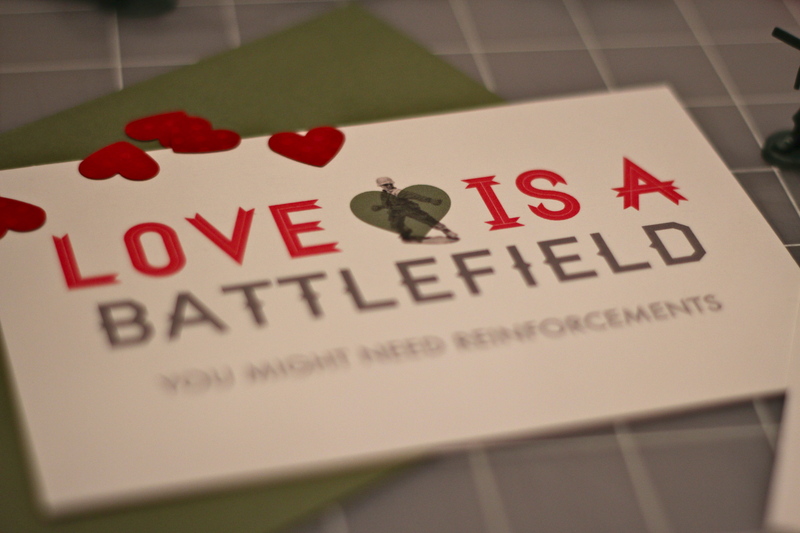 Wouldn’t you like a little help navigating the battlefield of love? My heart feels quite safe now. Happy Valentines Day, or as we like to celebrate it, Van Halen-stine Day! i haven’t checked my mailbox in two days, but i am gonna be really sad if it’s empty tomorrow.